On average, older victims experience abuse for twice as long before seeking help as those aged under 61 and nearly half have a disability. Yet older clients are hugely underrepresented among domestic abuse services. In the first of our Spotlights series, which runs through July and August, we’ll focus on the challenges facing professionals working with older people experiencing abuse. What can we do to reach older victims? How can we make sure they become – and stay – safe? We'll post the latest research and practical resources for professionals working with this client group. This is also your chance to hear from experts around the UK via webinars, blogs and podcasts, and share your thoughts in our live Twitter Q&A. You'll find new content every week – so bookmark this page for the latest updates, subscribe to our practice and policy blogs, or follow us on Twitter and Facebook to stay in the loop. 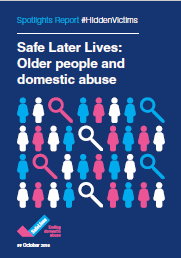 You can read the findings, as well as policy and practice recommendations, in our report: Safe Later Lives. “For too long domestic abuse in later life has been a hidden issue, with hidden victims. It can be extremely hard for older people to speak out about it and many services simply have not yet recognised that domestic abuse affects people of all ages. “The impact of abuse on older people is profound and damaging, whatever form it takes and whoever is responsible for it. Every older person should be able to live life free from abuse and this report is an important step forward because it brings a neglected and taboo issue into the light. Domestic abuse charity Standing Together write about the importance of a coordinated community response when helping older victims of abuse. Richard Powley, Head of Safeguarding at Age UK takes a look at what can be done to improve the help and support offered to older people experiencing domestic abuse. It's our right to be safe at any age. How can we make it easier for older victims to get help? 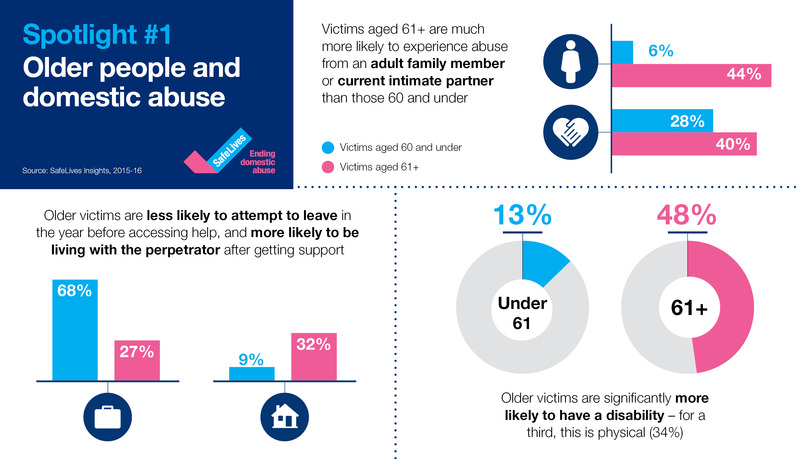 Older victims are hugely under-represented within domestic abuse services, despite typically living with the abuse for far longer. Monsura Mahmud, from Solace Women's Aid's Silver Project, looks at some of the reasons why. How can we keep older victims engaged once they access support? Monsura suggests ways to mitigate the risks faced by older victims accessing services. Older, safer - is it too much to ask? Jo Silver, SafeLives’ Director of Practice shares key points from a recent piece of work designed highlight how older people can be missed by services. How might a different approach increase the safety and identification of older victims? Steve Bartley, Safeguarding and Access to Justice Programme Lead for the Older People's Commissioner for Wales, joins SafeLives’ Lucy Giles to discuss how Maracs can best support older victims of abuse. On the blog: It's our right to be safe at any age. How can we make it easier for older victims to get help? Read blog posts from AgeUK, Solace Women's Aid, Standing Together and SafeLives.